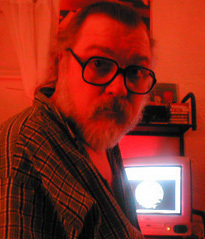 A unique collaboration featuring the multi-instrumental talents of R. Stevie Moore (below left) and Yukio Yung (below right). 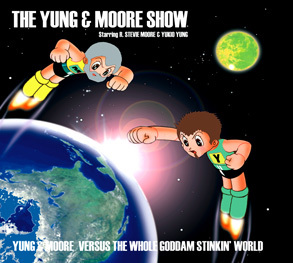 The Yung & Moore Show have just completed their first full-length album, Yung & Moore Versus The Whole Goddam Stinkin' World. It's a 61-minute digipak CD and is released on the Orgone label on July 3, 2006. Worldwide distribution is through Shellshock. You can buy (or order) it from any good music store - including Amazon and Play.Com - or direct from the Orgone/Onoma online shop. Like all Orgone and Onoma releases, Yung & Moore Versus The Whole Goddam Stinkin' World has its own web page. You can think of it as an extended jacket - a place where you might find all sorts of additional information, interviews/discussions with the artists, how they did things, why they did things, photographs, weblinks, further tracks you can play or download... anything, really. 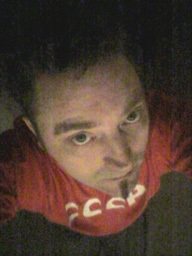 To visit the official Yung & Moore Versus The Whole Goddam Stinkin' World web page, click on any of the pictures above.